Our positions are full for 2019. If you are interested in working on the farm in 2020, please contact us in December. Thank you. The Farm at Sunnyside sits on a 400 acre parcel in Rappahannock County, VA in the shadow of Shenandoah National Park. In 2019, we will grow about 15 acres of vegetables, maintain 10 acres of fruit orchard, manage 400 laying hens and continue our on-farm compost making program. We sell mainly through farmer’s markets, an on-farm CSA and wholesale relationships with a few restaurants. We are passionate about regenerative agriculture, environmental conservation and inspiring new growers. We enjoy growing high quality produce for our crew, customers and local community. We participate in two local beer/food festivals at our local brewery because Farmer Casey loves cooking (and likes beer). We sell the majority of our produce through farmer’s markets, but have a CSA and wholesale relationships with a few restaurants. It’s more than a farm internship: we will explain our methods at our daily meetings and believe you will inherently learn a lot on the job while being paid hourly. In 2019, The Farm at Sunnyside is hiring 6-8 seasonal workers for periods sometime between April and November. These workers will join the team of two farm managers and a permanent staff member. Workers will be involved in most aspects of farm work, including planting, weeding, harvesting, processing and marketing vegetables. These can be difficult, sometimes tedious jobs, done in all kinds of weather. They do not require previous experience, but it takes more than a few weeks to learn to do each task well and with some speed. There will be specific job responsibilities that certain crew members will take more responsibility for. Some examples of this include greenhouse management, irrigation, high tunnel management, washing and packing and market prep. Returning (or experienced) workers learn new tasks and responsibilities like tractor driving, managing a farmer’s market or wholesale deliveries. Compensation includes on-farm housing, access to very tasty and healthy vegetables and eggs, hourly pay DOE (starting at $8.00 per hour with no experience) and participation in the local CRAFT program (farm field trips). 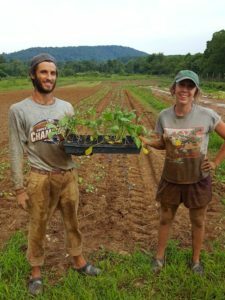 Stacey Carlberg and Casey Gustowarow met at The Farm at Sunnyside in 2009 and returned as managers in 2015 after 4 years of running Potomac Vegetable Farms in Loudoun County, VA. This year will be their 11th season on a farm. Stacey studied Ecology at The Ohio State University and worked at several environmental non-profits in Washington State and Virginia before finding her way to farming. She moved to Virginia in 2006 to work at Waterpenny Farm. She likes working at this scale of farming, which enables her to hire and teach numerous employees each season – hoping they will have a formative year (or more) on the farm. Casey studied environmental biology at McDaniel College in Westminster, MD. Casey came to farming after working in the field of marine conservation with the Peace Corps in the Phillippines. Traveling throughout SE Asia and visiting so many vibrant markets and eating delicious treats, Casey’s interest in food and how it is grown was reignited. He came to Sunnyside in 2008 and became intrigued not only in the farming happening here but also the conservation work on the property. Casey is very interested in building healthy soil and working at the scale of Sunnyside which allows the land to have an effective rotation integrated with cover crops. Email Stacey Carlberg, Farm Manager for more information. Thank you for your patience with my reply. I am working on the farm and do my best to respond in 24-48 hours.